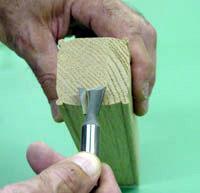 The dovetail bit is used to put a dovetail pin on the end of the skirt and a dovetail stopped slot in the leg. 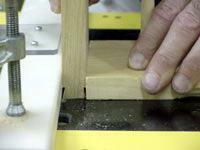 This is an easy method of tying the skirt to the leg and makes a very solid joint. 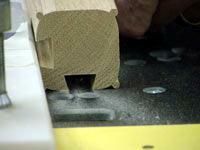 We used a 3/4” dovetail bit (3/8” high) on a table mounted router. 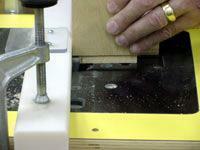 Use masking tape to set the stop mark when cutting the slot in the center of the leg. 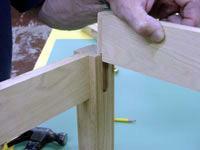 Adjust the fence so the dovetail bit is centered on the 1 1/8” square leg and run two stopped dovetails. 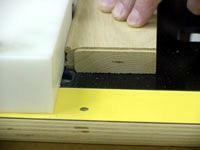 Next, adjust the fence over the bit to expose only the angle part of the dovetail bit. 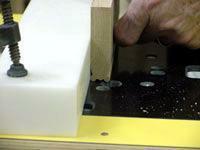 Stand the skirt on edge and cut the dovetail profile on both sides. 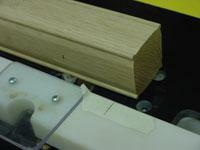 The pin must fit smoothly in the dovetail slot. 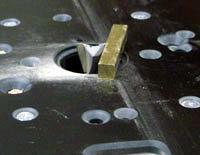 Insert the skirt upside down in the dovetail slot and mark the amount of pin that needs to be removed. This will be cut in a few passes. 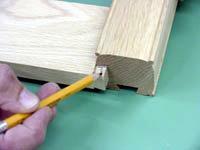 Adjust the fence two or three times to remove the pin until the top edge of the skirt and leg are flush. After the skirts are fitted to the legs, you may want to put the same draw line bit profile on the bottom edge of the skirt to match the leg. Check this link for information on the draw line profile.